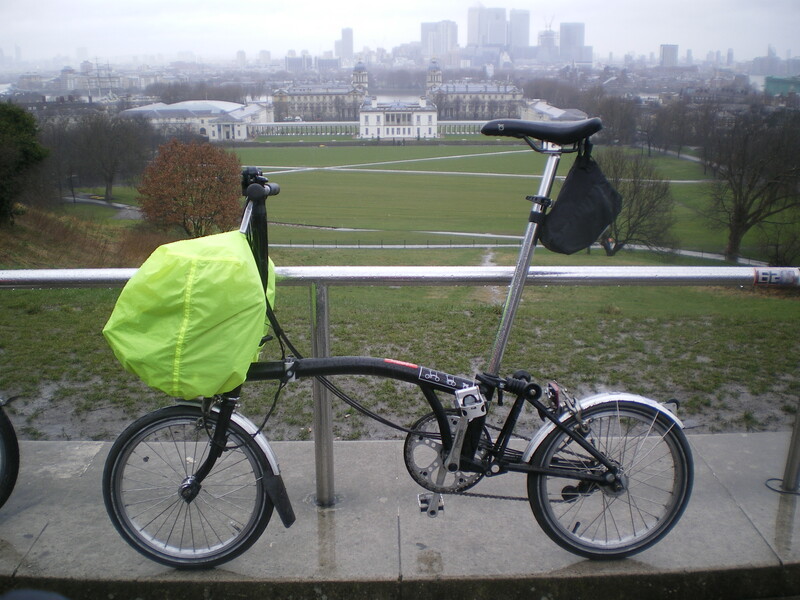 A grand day out with the London Brompton Club! 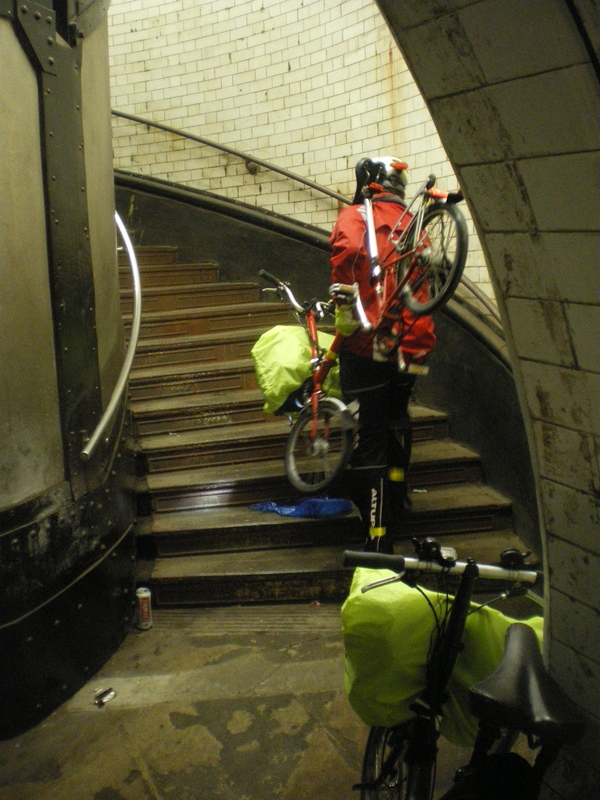 An early start to catch the 0733 train from Northampton to Euston and then a quick pedal to reach Charing Cross Station at 9.00 a.m. where the Club was meeting. 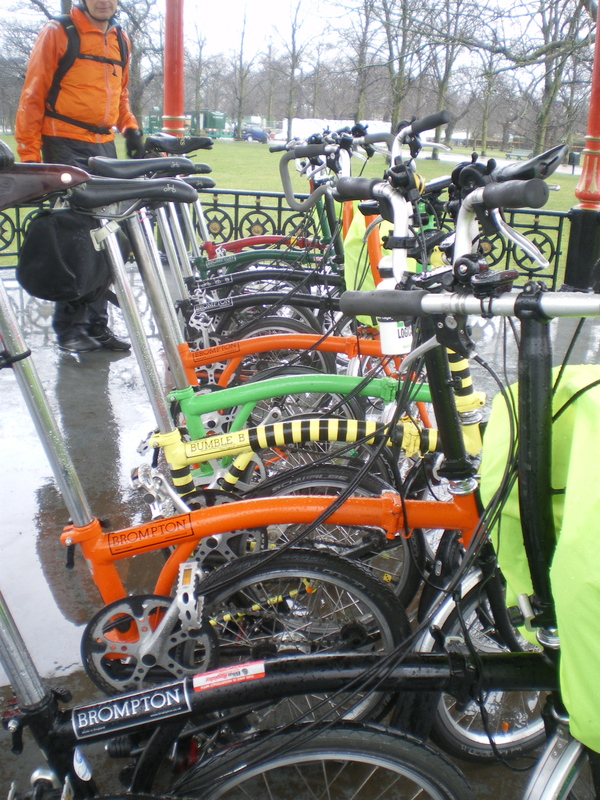 We pedalled along the Strand, past the Royal Courts of Justice and into the City. Soon we were speeding past the Tower of London and dipping down a side road to St Katherine’s Dock for the first photo shoot. Canary Wharf seems prosperous, especially next to the original parts of the Isle of Dogs but then there was a brilliant surprise – the Mudchute Farm – for elevenses. 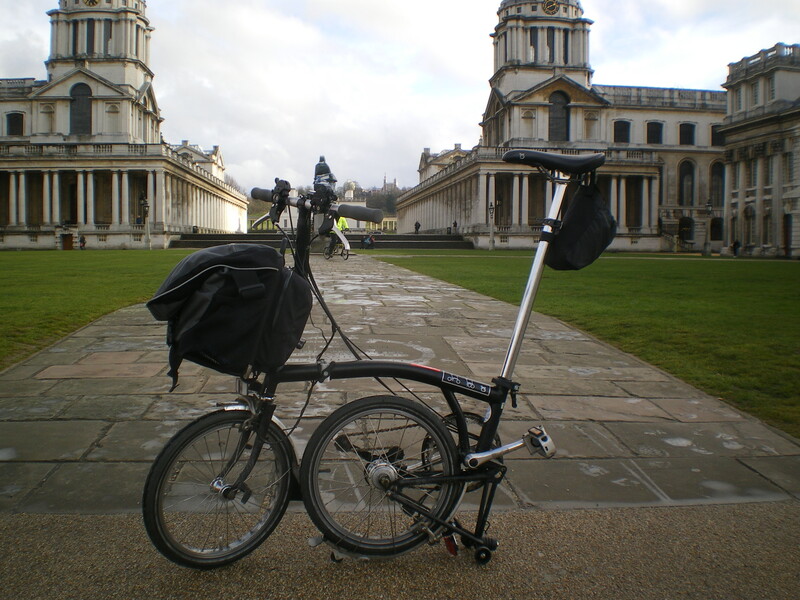 We had our first sight of our final destination, the Old Royal Naval College. 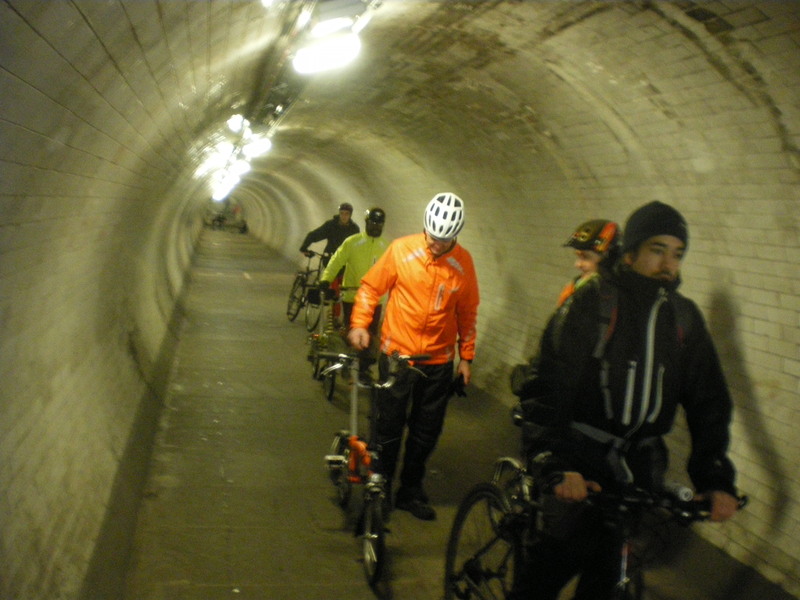 Then we went under the Thames by the Greenwich Foot Tunnel. 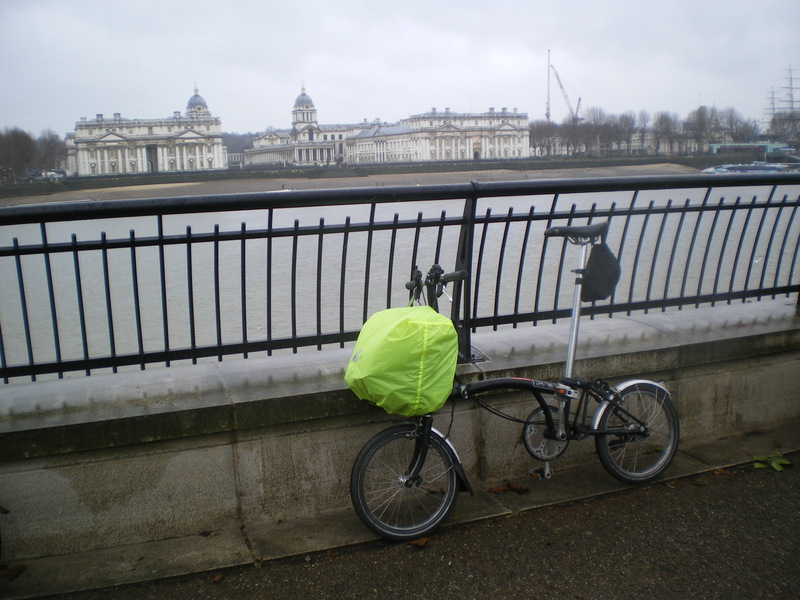 We popped beside the Cutty Sark for the one climb of the day up Greenwich Park to Wolfe’s statue beside the Observatory to look down on the College. To shelter from the rain, we found a bandstand. 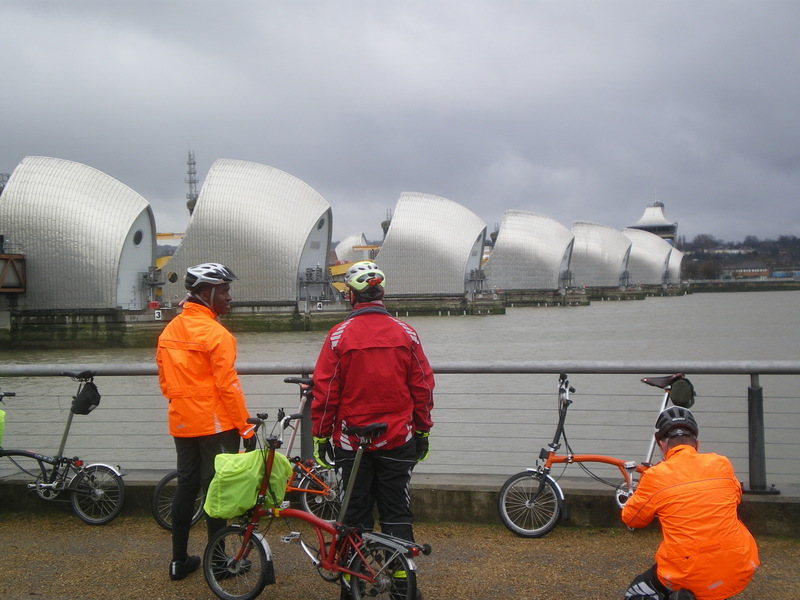 A steep swoop down to the riverside and a circumnavigation of the Millennium Dome (or O2 Arena), under the cable cars, and onto the Thames Barrier café for lunch. 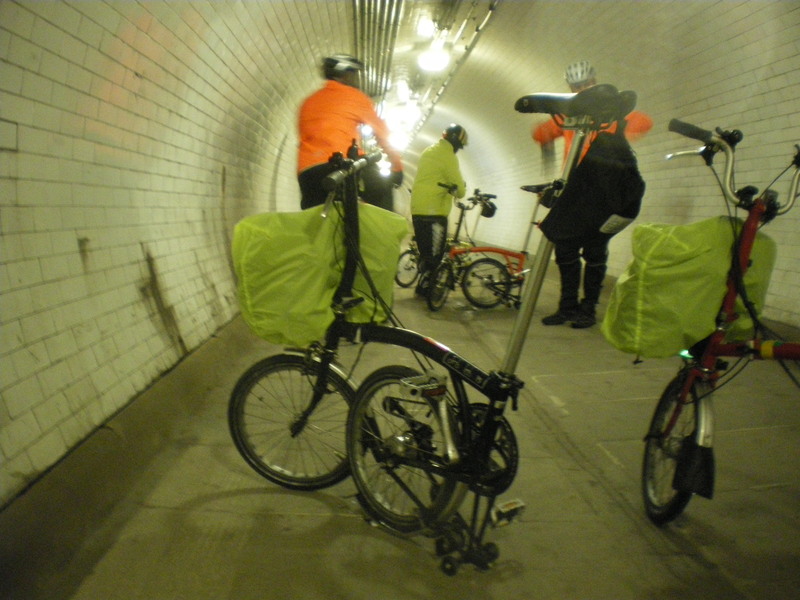 Then a second crossing, again under the river, but by the much quieter Woolwich Foot Tunnel. No lift here though – so 127 steps to climb. 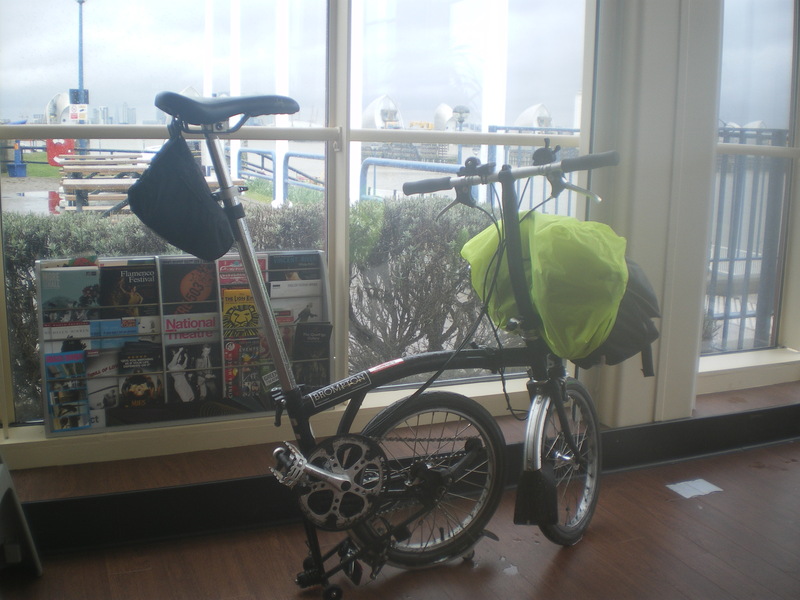 This pops up at Silvertown with a good view of the barrier. 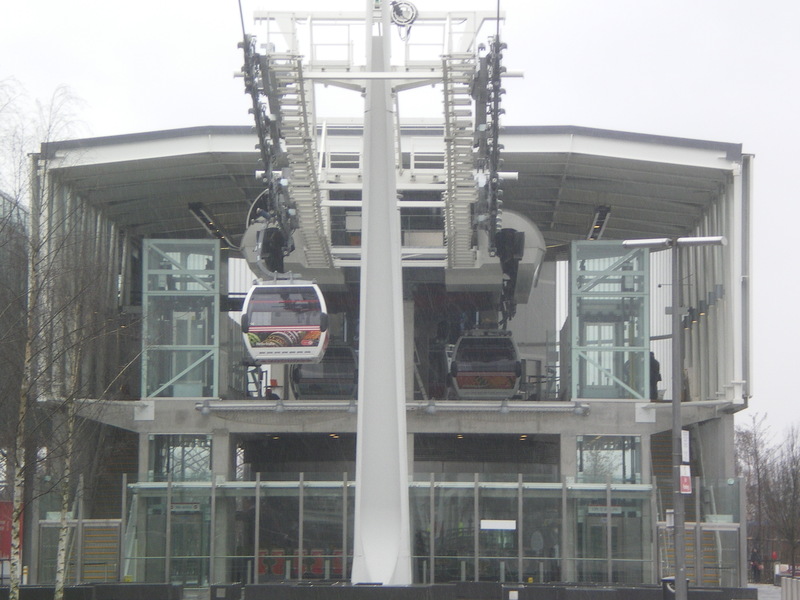 From here it’s a short ride to the northern end of the cable car ride at the Royal Docks. The cable car ride (the Emirates Air Line) was a great giggle! Deposited on the south side of the river again, we made our way to the Old Royal Naval College. 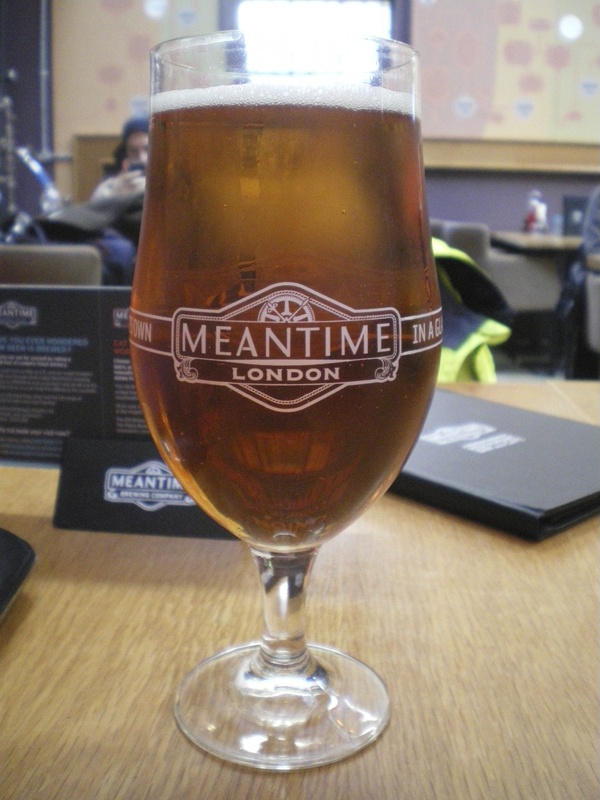 And studied the beers on offer at the Meantime Brewery! 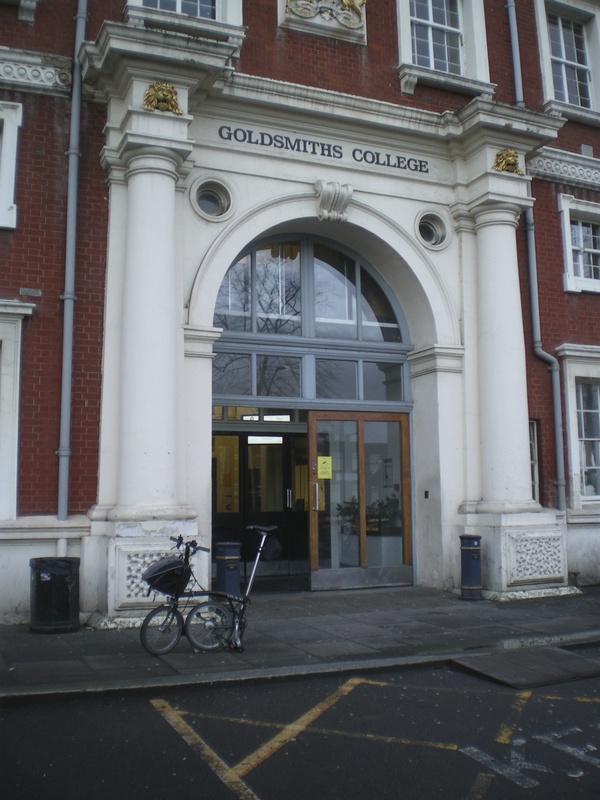 I then pedalled back to Euston via Goldsmiths College. I first walked through this door in December 1965! Then I crossed Tower Bridge and a meander through Bethnal Green, eventually finding Roseberry Avenue and Grays Inn Road to get to the station!